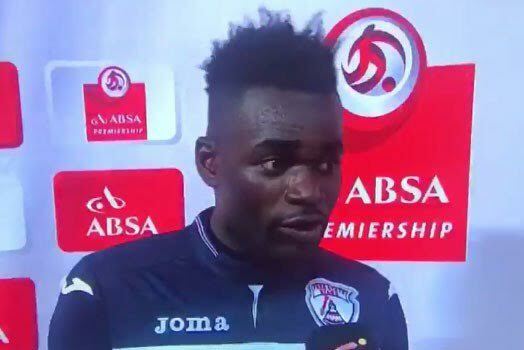 Ghanaian footballer, Mohammed Anas made one of the most hilarious blunders in post match interviews. Anas was awarded the man of the match award after scoring twice for his Free State Stars team in their 2-2 draw with Ajax Cape Town on Friday evening. During his post-match interview, the striker said: 'Firstly I appreciate my fans,' he began. '(And) my wife and my girlfriend.'. On noticing the slip of tongue, he quickly clarified he intended to thank his wife. 'I’m so sorry, my wife!' he exclaimed. 'I love you so much from my heart. Thanks for supporting me there is more to come,' he stuttered before the interview came to an end. However, his apology couldn't stop the post-match interview from going viral with many tagging him as an 'unfaithful husband'. But speaking in an interview with BBC, he denied having a girlfriend saying he was referring to his daughter. 'My family knows that I call my daughter my girlfriend. That's what I was talking about. I don't have a girlfriend,' he said. He said he was surprised after thousands of people had watched the video. 'I'm famous now - people around the world know me,' the footballer said. He added he was not worried about his wife's reaction , who is a South African. 'I love her so much. She's given me two beautiful children. She is fine. She knows what kind of man I am so I am not worried," he said.